With a little over a month on the job, American River College President Thomas Greene has clearly established his priorities. His first was to be able to get around campus without help and without getting lost. Greene was president of academic affairs and student services at Lake Tahoe Community College prior to coming to ARC, and admits the two are quite different in terms of size and complexity. “It’s like comparing a hummingbird to an eagle,” said Greene. Because of Greene’s usual outfit of a suit and tie, he was stopped and asked for directions more than once in his first few weeks, and was often unable to provide help. According to Greene, one lost student even said she wished Greene was “the president” and could tell her exactly where to go. “I started laughing and said, ‘Well, I am the president,’ and she said, ‘No you’re not, you’re kidding.’ So I handed her a business card and she started laughing hysterically,” said Greene. Greene knows his way around campus now, though, and has done his best to get acclimated with both his surroundings and the people on campus. From attending the opening of the fall faculty art show at ARC’s Kaneko Gallery to sitting in the stands at soccer or water polo games after he leaves his office for the day, Greene spends his time out and about as well as in the office. “I think that quite a bit of my early work has been trying to get to know as many people as I can,” said Greene, who added that staff on campus have set up tours for him to familiarize himself with departments at ARC. “There’s an amazing diversity of programs and opportunities for students,” said Greene. In the short term, there are two matters that Greene is focusing attention and energy on: accreditation and campus safety. Campus safety has been a concern recently at ARC, and needs urgent attention, said Greene. “I recognize that’s something that can’t wait,” said Greene. Greene’s other priority, accreditation, is a process run by the Accrediting Commission for Community and Junior Colleges, a third party agency who will decide whether or not ARC “maintains standards requisite for its graduates to gain admission to other reputable institutions of higher learning or to achieve credentials for professional practice,” as defined by the U.S. Department of Education. ARC and all other Los Rios colleges will be up for review in January 2015. With all this and more, Greene describes his presidency at ARC so far in one word. 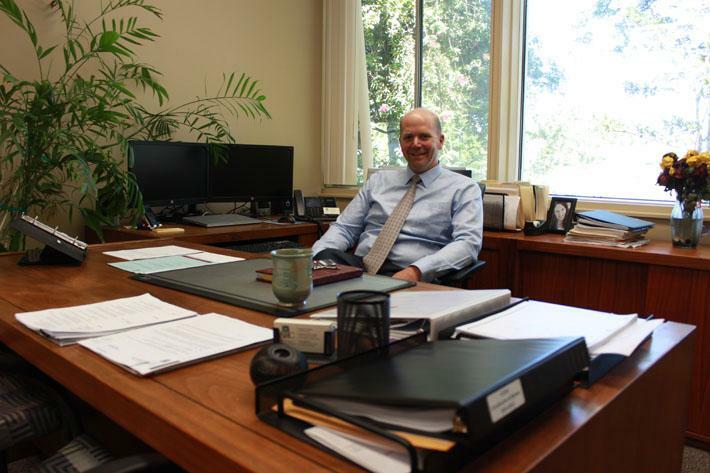 Be the first to comment on "President Greene settles in at ARC"